still dreaming of fall, of course! thank goodness the extreme heat wave we had around these parts in past weeks appears to have relented (at least temporarily). i'm crossing my fingers and hoping against hope that fall comes quickly, as i simply adore cool weather! i spent the past weekend in jacksonville, florida, attending a family wedding. it was a whirlwind trip, but of course i made time to do a little tiny bit of thrifting! i also snuck in some thrifting fun last week, before i went out of town. i'm an addict! 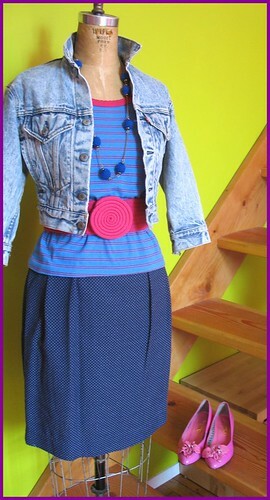 more fall outfits. again, almost everything is second-hand! 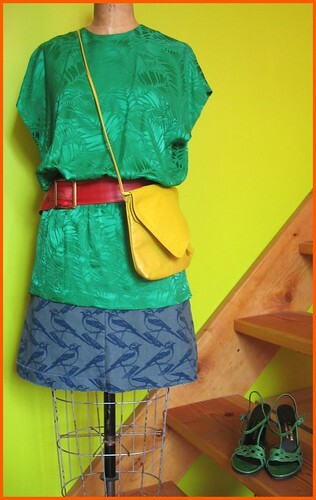 -green silk jaquard print 80s dress, restyled into a tunic top: thrifted in florida -blue bird print a-line mini skirt: ivana helsinki, found at buffalo exchange -red leather belt with snakeskin patch: zachary's smile -yellow faux snakeskin leather purse: salvation army, chelsea, manhattan. -green charles jourdan strappy sandals with 4" heels, thrifted in florida. *** looking at these outfits (and others i wear and put together), i notice that i favor certain things in general, and note that the things i favor are influenced my my body shape, and knowing what works for it in a more successful manner. for instance, because i am way more than a little ample in the bust, i wear a lot of knits on top: tees, sweaters, and the like. woven tops are often cut for smaller cup sizes, and if bought larger to accommodate that part of my body, they need to be adjusted at the sides to reveal my proportionately smaller waist, and that's just for starters. basically, it's much harder to make woven tops work for me. i also draw attention to said waist with belts, of which i have many, many, many. i have been doing this for some time, even before the recent trend for waist cinching belts. my hips are relatively slim and straight, but i'm short (about 5' 3") so i wear a lot of skirts that are straight, pegged, or a-line, and hit above the knee, to reveal my calves, which are slim enough to show off. any longer, and i look truncated and out of proportion. same goes for pants, when i wear them: straight/stovepipe or slim works best at the moment. wide legs make me look as such, and cropped pant styles do short me no favors. it's also interesting to note that some of the things i like seem to have recently intersected with what's currently chic...slim skirts, boots, waist cinching belts, and the like. this is not intentional, per se. sometimes i feel like someone's watching me! but in the end, i'll probably continue to wear these sorts of things after they go "out of style," unless my body's topography changes drastically. and even in that event, i'll likely strive to find the shapes and proportions that work for me, not against me. and before i go, let me point out the (not-so?) obvious: i post these sorts of things because i want others to believe that one can find current and highly chic styles and shapes by hitting the thrifts and second-hand shops, NOT the malls and high-end boutiques. find it for less, save your money, and spend on what will really last and what will really work for you. buy used, buy quality, buy the original, buy *you*.